The second quarter of the year has seen a surge of activity in Worcester-shire’s country-house market, where local estate agency Andrew Grant (01905 734735) celebrated its 40th anniversary by announcing the sale of an encouraging £90 million worth of property between March and June. Commenting on the recent trend, the firm’s founder, Andrew Grant, observes, ‘we all know that it takes more than one swallow to make a summer, but it’s pleasing to see an increase both in the number of good country properties coming to the market and the number of serious buyers who are waking up to the fact that, compared with neighbouring counties, you get a lot more for your money in Worcestershire’. Typical of the kind of deal currently on offer is the sale, at a guide price of £1.2 million, of The Turret House at Hampton Lovett, two miles from the spa town of Droitwich, and 22 miles from central Birmingham. A striking Victorian country house with magnificent views of the Clent Hills, the Malverns and the Cotswold escarpment, The Turret House was built in about 1891 ‘for less than £1,000′ for the former Miss Elizabeth Amphlett, whose family seat at the time was nearby Wychbold Hall. Steeped in Worcestershire tradition, the 5,000sq ft property has four reception rooms-including light and spacious drawing and dining rooms-a well-equipped kitchen/breakfast room, nine bed-rooms, two bathrooms, a cellar and outhouses. It stands in 1.7 acres of gardens on the edge of Hampton Lovett village, once part of a 1,000-acre estate that was owned from 1524 to 1900 by the royalist Pakington family. In the mid 1800s, John Somerset Pakington was Secretary of State for War and the Colonies in Sir Robert Peel’s government, and was created 1st Baron Hampton in 1846.
it was a handsome Queen Anne red-brick house. In 1779, John Stone bought the estate from George Turber-ville of Twyning, near Tewkesbury. According to Pevsner, in 1845-47, Stone’s son, Edward Gresley Stone, commissioned Richard Armstrong to enlarge and aggrandise the Queen Anne house, by encasing it in grey stone to create the present five-bay house with its projecting centre, Jacobean-style arched doorway and adjoining Victorian stone conservatory. For much of the late 19th century, the Stones, who also owned nearby Eastington Manor, leased Chambers Court to the MP Capt Grice-Hutchinson. Then, in 1913, Edward Gresley Stone’s son, Capt W. H. Stone, sold both Eastington and Chambers Court to a syndicate, which led to both estates being divided up and dispersed. For the past 30 years or more, Chambers Court has been the home of His Honour David McEvoy, QC, and his wife, Belinda, who are now looking to downsize. Little altered during his tenure, the 8,900sq ft house stands at the end of a long drive, surrounded by 33 acres of walled and traditional gardens, pasture and wood-land, against the backdrop of the Malvern Hills. Chambers Court has four beautifully proportioned reception rooms, a kitchen/breakfast room, seven bedrooms, three bathrooms, a vast second-floor attic, cellars, and an old-fashioned courtyard of traditional estate buildings. Peter Edwards of Knight Frank’s country department is equally upbeat about the prospects for the Worcestershire market this autumn, his confidence boosted by the rapid sale of tranquil, Grade II-listed Maes Court (Country Life, June 1) at Knighton-on-Teme, four miles from Tenbury Wells. It went under offer within weeks of its launch in early May at a guide price of £1.75m, and has already exchanged contracts, with completion due in late August. Built in 1630 and extended in Georgian times, the pristine, eight-bedroom property sits in the middle of 9.7 acres of grounds overlooking the beautiful Teme valley. ‘As in other parts of the country, the market in April was disrupted by the extended bank holidays around Easter, coupled with the school holidays and the Royal Wedding. But things took off again in May, with sales being agreed particularly quickly on new instructions that have been priced to catch the eye, of which Maes Court is a prime example,’ explains Mr Edwards. With that principle no doubt in mind, Knight Frank’s Worcester office (01905 723438) has significantly adjusted the price of the immaculate Old Rectory at Great Comberton, on the edge of Bredon Hill-2.6 miles from Pershore and 17 miles from Cheltenham-from £2m-plus to £1.575m. 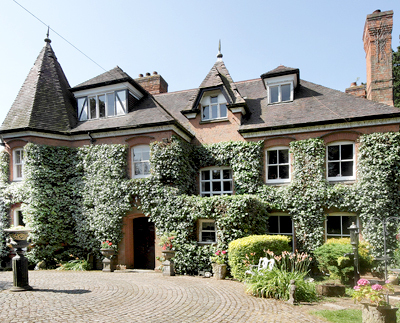 Painstakingly renovated since the early 1990s, the 9,000sq ft, Queen Anne/Victorian former rectory has four main reception rooms, five main bedrooms, five bathrooms, a staff flat, a heated swimming pool and leisure complex, and 1.7 acres of grounds with views of the Malvern Hills. variety) can now expect to buy a classic Georgian country house with land within easy reach of excellent schools in Malvern, Worcester or Cheltenham, and for considerably less than the £2m-£3m it would have cost four years ago.